Happy Passover or Easter, whichever applies. The world is passing through profound paradigm shifts rights now so we’re planning to “hyperfocus” on just a couple of key items this weekend. First John produces an extended boralogue on the new emerging global economic system and a vocabulary emerging from the G20 summit, including “transnationalism” and “responsible sovereignty.” What does it all mean? One of those G20 phrases is — surprise surprise — the time-tried “new world order.” So does this mean all our politicians are now conspiracy theorists? Perhaps an examination of the 100-year history of that expression would be in order. 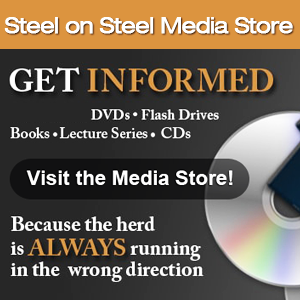 We’ll run clips from a Steel on Steel show from 14 years ago. Then historian Dr. Dennis Cuddy, author of “The New World Order and the Road to Socialism,” returns to check on what the globalists are cooking up in the midst of the universal economic crisis.